Like him or not, the Senator has been a part of of American life for almost half a century. May he rest in peace and rise in glory. Today, August sixth, we remember the radical change in appearance of Our Lord Jesus Christ, while in the presence of Peter, James, and John, on a high mountain. 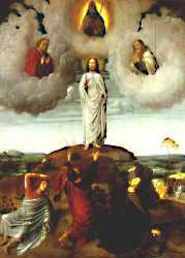 The Transfiguration revealed Christ's glory to His disciples, in shining splendor of Uncreated Light. For a moment the veil is drawn aside, and men still on earth are permitted a glimpse of the heavenly reality, the glory of the Eternal Triune God. Before that small group of Apostles, Christ was shown greater than the Lawgiver (Moses) and greater than the Prophets (Elijah), He was shown to be the Messiah. At this feast, people often say Jesus was changed on Mount Tabor, but in fact it was the Apostles. May our own hearts be Transfigured in our daily lives in such a way to see the manifestation of the Divine glory that is in our lives, each and every day. May that Light, Uncreated since before the world began, shine on us also. O God, Who on the holy mount revealed to chosen witnesses Your well-beloved Son, wonderfully transfigured, in raiment white and glistening: Mercifully grant that we, being delivered from the disquietude of this world, may by faith behold the King in His beauty; Who with You, O Father, and You, O Holy Spirit, lives and reigns, one God, for ever and ever. the moon for light, his cloak a moving shadow while he walked,"
So goes the song from Bob Ayala. It has always gripped my imagination, seeing the image of Nicodemus, slipping though the night, not wanting to be seen, but wanting more, maybe needing to meet with Jesus to know what was the truth about this Nazarene Rabbi. When he talks with Jesus, he is told that "no one can see the kingdom of God without being born from above". Now these days we are familiar with being "born again", but imagine what it was like for this leader of Israel. Jesus might as well told him he needed green skin or required backwards knees to "see the kingdom of God." Being born a second time made about that much sense to someone when hearing it for the first time. But Nicodemus did not let it drop, but continued his exploration of Jesus' word and ministry. We see him defending Jesus in the Sanhedrin and joining Joseph of Arimathaea to gather up and bury Him after the crucifixion. 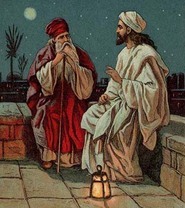 O God, Who led the learned scholar and judge Nicodemus to seek for wisdom from the mouth of Your Son Jesus Christ, give to all persons, both scholars and others, minds that are open and hearts that are ready to hear the good news of salvation, not rejecting out of hand what seems strange or unfamiliar in it, but carefully studying to understand it; through Jesus Christ our Lord, Who lives and reigns with You and the Holy Spirit, one God, now and ever.